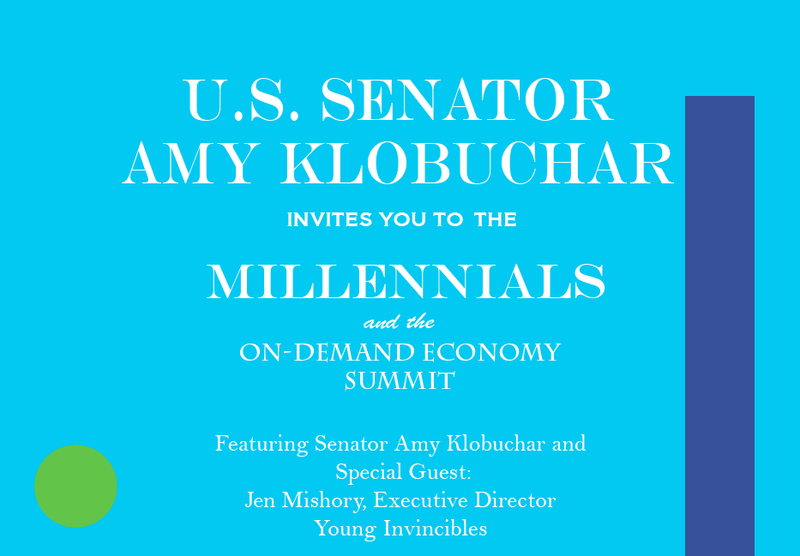 I’m excited to have been invited to participate in Senator Klobuchar’s “Millennials and the On-Demand Economy Summit” tomorrow at Sport Ngin. Note that the event time has been revised to 11:30am. Join us for an engaging conversation about issues impacting Millennials across Minnesota! The event will highlight issues facing one of the nation’s largest generations that is currently entering the workforce. Sen. Amy Klobuchar is hosting a summit on Tuesday that will focus on issues impacting millennials. The event, which takes places at Sport Ngin’s headquarters in Northeast Minneapolis at 11:30 a.m., will focus on navigating the on-demand economy, managing student loan debt and participation in workforce development and apprenticeship programs. Millennials are the generation born roughly from the early 1980s until 2000. The event is being hosted at Sport Ngin in part because the business was founded entirely by millennials. Other prominent names at the event are Jen Mishory (executive director of Young Invincibles), Justin Kaufenberg (CEO of Sport Ngin), Merrill Irving (president of Hennepin Community & Technical College), Diane Tran (founder of Minnesota Rising) and Matt Lewis (strategy manager of Greater MSP).